Pitlochry's growth from tiny settlement to bustling and attractive town can be traced back to a two notable visitors. The first was General Wade in the early 1700s, who built one of his main military routes north through what is now the town. The second was Queen Victoria, who in 1842 stayed at nearby Blair Castle. Her favourable comments marked the start of Pitlochry's real growth as a popular tourist destination. The arrival of the third visitor, the railway, in 1863 confirmed it as one of the premier mountain resorts in the country. Today the town retains a good rail service. Given its history, it is no surprise to find in Pitlochry a solid town with a stone-built Victorian air. But unlike so many places matching that description, Pitlochry seems to have maintained its vitality. The range and quality of the shopping is superb; so while you can find tartan dolls waving Saltires, you can also find a really good selection of "normal" high street shops as well as a range of mid to upmarket outlets specialising in a wide variety of goods. The bypassing of the town some decades ago by the A9 has done little to diminish just how busy a place it can become. 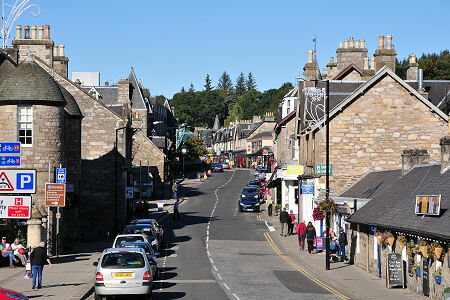 Even if you're not into shopping there's a great deal to see and do in Pitlochry. The cultural highlight is the Pitlochry Festival Theatre, just across the River Tummel and accessible for pedestrians by means of an interesting suspension bridge. The theatre is famed for allowing visitors to see up to eight different plays in a week: though however much you love the theatre that might just constitute an overdose. 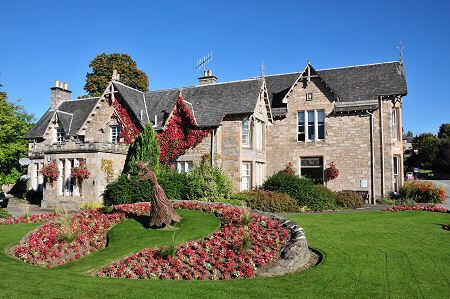 Pitlochry is also home to a wide range of hotels, guest houses, B&Bs and hostels, and the magnificent Atholl Palace Hotel is especially prominent on the skyline when the town is seen from a distance. One of the most attractive features of Pitlochry is that it is surrounded by mountains. They may not be amongst Scotland's highest, but include Pitlochry's own Ben Vrackie, at 841m or 2,759ft, which is obvious in many views to the north east from the town. It is usually climbed from Moulin, a north eastern, uphill outlier of Pitlochry. Less obvious is that beyond Ben Vrackie lies the Cairngorm massif, one of the largest and remotest of Scotland's mountain ranges. Other tastes are also catered for. The Blair Athol Distillery towards the southern end of the town was founded in 1798, making it one of Scotland's oldest distilleries, and offers a visitor centre. Up on the hillside to the east of the town lies a second distillery, the Edradour, which until the advent of the new wave of micro-distilleries was the smallest in Scotland. Here, too, you will find a visitor centre. Meanwhile a mile south of the town is the Dunfallandy Stone, a Pictish cross slab. Lovers of beer rather than malt whisky will find a working brewery in the town, at the Moulin Hotel in Moulin, on the eastern edge of Pitlochry. And there are other good pubs to choose from too, including the Port-na-Craig Inn and Restaurant, on the banks of the River Tummel and under the shadow of both the Festival Theatre and the hydroelectric dam. The only drawback here is that after a drink or two the swaying of the suspension bridge on your way back to the main part of Pitlochry might be a little disconcerting. The suspension bridge is also used by walkers following the 79 mile Rob Roy Way on its way into Pitlochry. Another, very unusual, attraction in Pitlochry is its very own dam, which was built across the River Tummel to create Loch Faskally. Associated with the dam is a "fish ladder" built to allow salmon to make their way upstream of the dam to spawn. Visitors can actually see the fish making this supreme effort at the right time of the year through glass walls in the ladder. The Pitlochry Hydroelectric Dam and Fish Ladder here tells the history of hydro electricity in Scotland and explains how "power from the glens" is harnessed at Pitlochry to produce enough clean electricity for 15,000 homes.